Drive to this location. Use 47 Town Street for address and to park.. Look for the gravesite at the rear of the burying ground closest to the parking lot. 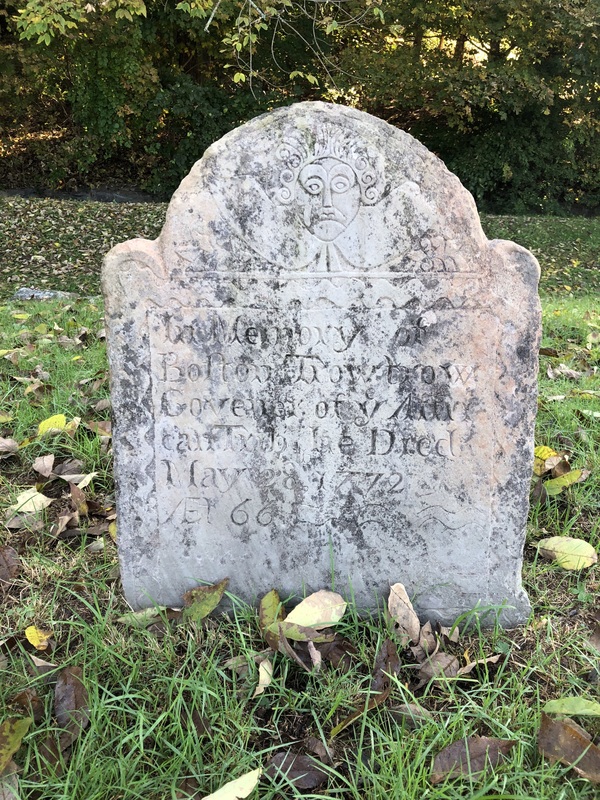 The gravesite of Boston Trowtrow is one of very few remaining tangible resources of the “Black Governors” of Connecticut. Evidence of the tradition of African Americans electing black governors, or kings, during the eighteenth century can be found in many New England colonies. In Connecticut, the practice, an adaption of African political tradition, began in the 1750s when slaves accompanied their owners to Hartford for the annual gubernatorial election in order to choose a person to be their representative as well. Later, the slaves throughout the colony held their own elections and sent the results to Hartford on the Saturday after Connecticut’s election, when the results were formally declared. Such elections are known to have occurred for about a century in Derby, Durham, Farmington, Hartford, New Haven, New London, Norwich and Seymour. In celebration of the occasion, the owner of a slave voted in as Black Governor paid for a dinner, followed by a parade simulating the inauguration parade where the winner of the election would ride at the head of a marching procession. Often, Black Governors were slaves of prominent masters or a respected member of the free African American community in their own right. Despite their local status, Black Governors had little regulatory power and their task consisted of serving as mediators between white and black communities. Such “Governors” held no administrative power—they could not, for example, punish a white individual accused of a crime against a black individual. Boston Trowtrow, who served in the office from 1770 to 1772, was one of three Black Governors in Norwich. His grave inscription reads: “In Memory of Boston Trowtrow Govener of ye Affrican Trib he Died May 28 1772 Æ 66.” Trowtrow was said to have been a slave of Jabez Huntington (1719-1786), one of Norwich’s most successful colonial merchants. Other Norwich Black Governors included former slave Ira Tosset and Sam Huntington, who was the property of Gov. Samuel Huntington.